Teaching reading to kids with special needs often requires pulling out all the tricks we have in our "bags" in order to see progress. I often find comprehension to be a particularly difficulty piece of teaching reading to get across to kids. Today I wanted to share with you an idea I have used that has worked with my kids over the years. No matter what I used teaching reading skills, I always made sure I have the four main strategies included in my reading instruction. The teacher tells the students why the strategy being worked on will help comprehension. she/He also explains when to apply the strategy. The teacher models how to apply the strategy while demonstrating using the text that is being used by the students. In guided practice the teacher guides and helps the students as they are working to know how and when to apply the strategy. The students apply and practice what has been taught until they can do it independently. One way to work on main idea is through the use of graphic organizers. One of my favorite organizers for main idea is an ice cream cone graphic. Have the student read a story or read it to them. Discuss the story and explain and model how you would take sentences and determine which ones contain main idea and which contain details. Think aloud as you make your decisions so the students can "see" how you come to the answers you use. 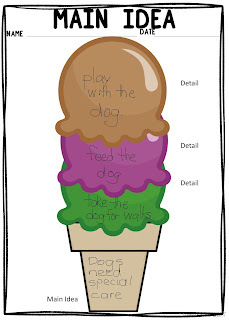 On this graphic organizer, place the main idea in the cone and a detail in each scoop of ice cream. In the next lesson, use the same organizer and read or read a different story to the students. Discuss the story and guide them as they make their decisions about main idea and details. Discuss everyone answers so everyone can correct their answers and understand the reasons for the correct answers. Finally, use a third story on the same level and readability but this time let the students complete the graphic organizer themselves as they apply what they have learned in the previous lessons. 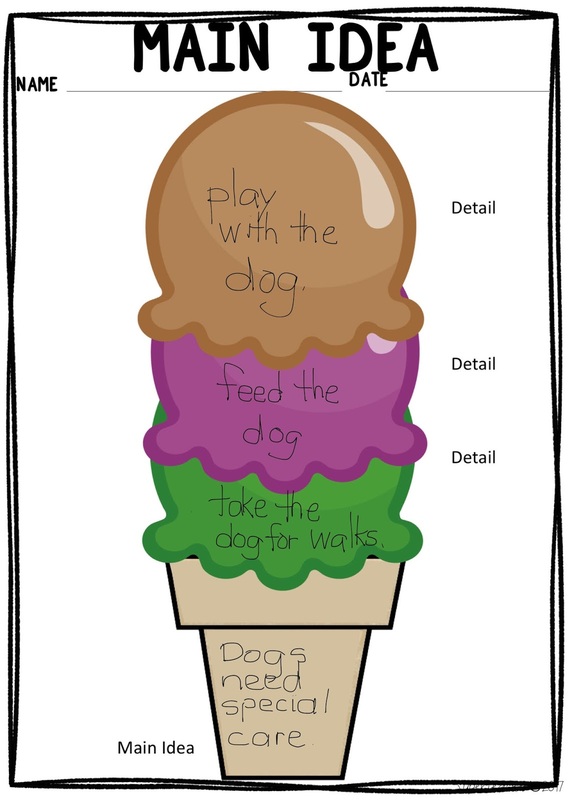 Here is an example of how the ice cream cone graphic organizer might look for the following paragraph. You have to take dogs for walks everyday. You feed your dog so they stay happy and healthy. You play with the dog frequently. 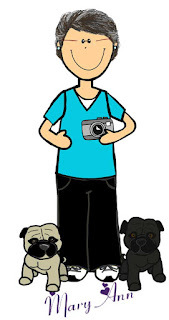 I have included a free downloadable of the file in my TpT store. 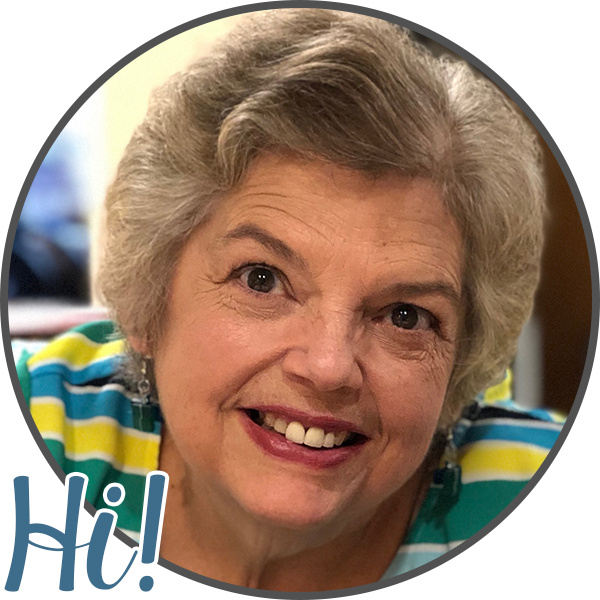 Click my logo below to take you there. 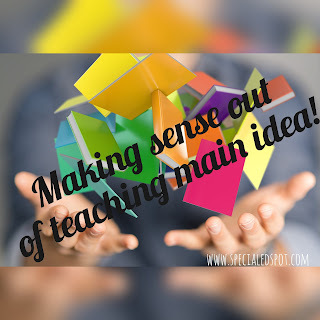 If you like the freebie checkout my variety packet of Main Idea Graphic Organizers.